Set/2 22"-30" Mushrooms for Statement Piece in Fairy Garden. 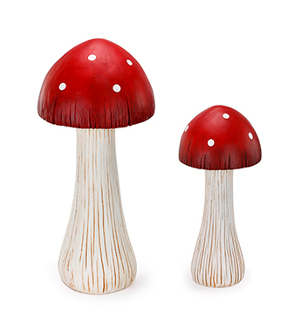 Our Products >> Set/2 22"-30" Mushrooms for Statement Piece in Fairy Garden. Set/2 22"-30" Mushrooms for Statement Piece in Fairy Garden.. Make a WOW statement in your garden with these oversized mushrooms! Beautiful red spotted caps.